An estimated reinforced battalion of North Vietnamese regulars attacked a forward base camp of the 1st Bn, 27th lnf "Wolfhounds" Dec. 12, some 13 kms from Cu Chi, costing them 39 dead and 11 weapons captured. The pre-dawn attack, which lasted an hour, was the first such fight ever reported in Hau Nghia Province between NVA troops and U.S. elements. Six Wolfhounds were wounded during the battle which at one point was reduced to hand-to-hand combat. The attack started shortly after 2 a.m., when the communists hit the base camp with heavy mortar, recoilless rifle and RPG 2 rocket fire. The dug in Wolfhounds returned fire with mortars and automatic weapons, and received heavy artillery support from here. Following their initial bombardment, the communists launched a two-pronged assault on the perimeter. The main force struck at the north perimeter while, at the same time, an ambush patrol hidden several hundred meters to the south reported an 80-man force approaching their position. For some unknown reason, this column veered off toward the north and disappeared without attacking. An Air Force AC-47 flare ship lit up the battlefield while 155mm howitzers continued to pound the frontal attack forces. Thousands of small arms and automatic weapons rounds poured into the communists. U.S. mortar rounds were landing on the perimeter cutting down the attackers that had broken through. Some hand-to-hand fighting was reported. The enemy broke contact at 4:30 a.m., leaving 39 of their dead strewn from the perimeter to a woodline some 300 meters to the north. At dawn, the defenders searched the area to include several small nearby hamlets looking for more enemy dead or wounded. Heavy blood trails indicated that communist losses were higher. Captured were an AK-47 and four of the newer AK-50 assault rifles, a CHICOM carbine, three RPG-2 rocket launchers, and two CK-56 machine guns. The infantrymen destroyed 1,000 rounds of small arms ammunition, 115 grenades, 15 mortar rounds, and 12 RPG-2 rounds. Documents found on the bodies identified the communists as members of the 2nd Bn, 101st NVA Regt. COL Edwin Emerson, 2nd Bde commander, disclosed the fact that this was the first time NVA troops have been found this far south and the first time that they have made contact with U.S. forces in Hau Nghia Province. This was the second contact for the Wolfhounds in less than 24 hours. Presently conducting Operation Saratoga, they hit a Viet Cong fortified position the day before, killing 10 of the enemy, detaining two others and capturing two weapons. Wolfhound losses were one killed and another wounded. Later that afternoon, the infantrymen made another contact with an estimated Viet Cong platoon. One Viet Cong was killed and a second one detained. There were no friendly casualties. On behalf of the people of Hawaii, I send warmest greetings of the season to each one of you. The name and fame of the 25th Infantry Division have a special meaning for the people of the 50th State, for we remember, with cordial friendship and sincere admiration, the many, memorable years when the 25th Division was stationed in Hawaii. In war and peace, we regard the 25th as "Hawaii's Own." We are proud and grateful for your patriotic service in this hour of our Nation's commitment in Vietnam. Although duty and distance separate you from your loved ones, we want you to know that our thoughts are with you during this most cherished time of the year. May your Christmas be brightened by the warmth of the pride, affection, and heartfelt Aloha of your family and friends everywhere, especially in Hawaii. 1ST BDE - Operation Barking Sands, the 1st Bde, 25th Inf Div's wide-ranging monsoon campaign, has been completed. In six months, the operation has seen brigade troops strike repeatedly in Hau Nghia Province, sweep through and level the Hobo Woods and drive into the Filhol Plantation. Initiated in May, Barking Sands at first was conducted primarily in the lower sector of the province and the area to the east towards the Saigon River. Designed to blunt the enemy's monsoon offensive before it began, and to firmly establish the allied presence, the Hau Nghia phase was characterized by continuous military pressure coupled with pacification efforts by the government's Rural Development (RD) cadre. The most notable of the RD efforts was the 47-day civic action program conducted at the village of Phu Hoa Dong. On the southeastern edge of the Filhol Plantation, the village long had been a haven for the enemy. 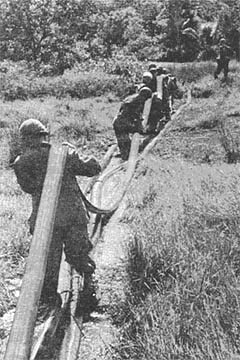 In July, Phu Hoa Dong was sealed and searched by a six-battalion U.S.-ARVN force. Civic Action teams from the brigade and II Field Force moved in to determine what the people needed in terms of health and education assistance. The village also was consolidated. More than 850 families were relocated from the heavily forested northwestern sector to the more open southeastern section. Once the homes were moved, a thousand-meter swath was cut around the village to deny cover to the local Viet Cong. In September, Barking Sands' focus shifted to the dense Hobo Woods, 60 kms northwest of Saigon. 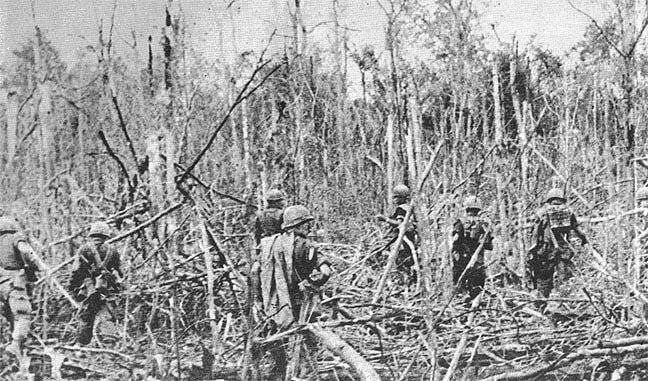 Troops of the 4th Bn, 9th Inf, and 2nd Bn, 14th Inf, hacked their way through the underbrush in search of the well-hidden and entrenched enemy. Meanwhile, Rome Plows from the 27th Land Clearing Team, secured by the 4th Bn (Mech), 23rd Inf, were cutting down 90 per cent of the 13,000 acre Viet Cong stronghold in 56 days. Helicopters finished off the secondary growth with defoliating chemicals. The area was heavily mined and boobytrapped. Apparently the guerrillas had spent much of their long occupancy digging. The extensive honeycombs of trenches, bunkers and tunnels -including one multi-level underground complex that traveled over 2,000 meters - yielded cameras, film, printing presses and type, in addition to the usual caches. The networks were destroyed by elements of the 65th Cbt Engr Bn. With the task in the Hobo almost done, the brigade sent the two "straight-leg" battalions into the Filhol Plantation. The plows and their escorts followed, cutting a swath along the north and east sides of the unworked plantation, to uncover escape routes to the Saigon River. 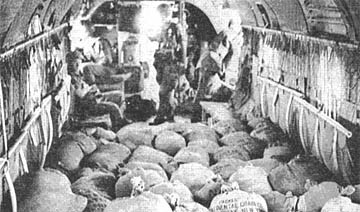 The final results of the far-flung operation were 480 enemy killed; 463 individual weapons and 29 crew-served weapons captured; and 260,365 rounds of small arms ammunition and 196 tons of rice uncovered. The 1st and 3rd Bdes reinforced by U.S. armor and engineer units and Vietnamese Infantry, have struck deep into War Zone C to launch Operation Yellowstone. Initial enemy contact was light. 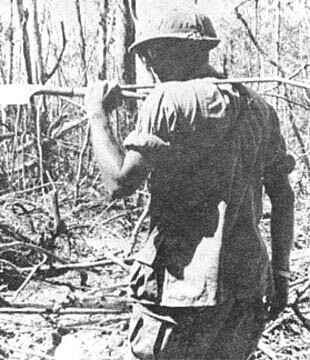 A U.S. infantry battalion spearheaded the operation. From a forward support base, the unit made an early-morning air assault near the airfield of the CIDG outpost at Katum 40 kms north of Tay Ninh This action and those of the entire day were supported by aircraft from the 269th Avn Bn. The airfield secured, artillery was lifted in by Chinook helicopters to support another U.S. unit hitting LZ's to the north of Katum. Shortly after the artillery was in place, the ARVN unit was inserted at the airfield - which lies less than 6 kms from the Cambodian border. Meanwhile, an armored column was moving along Highway 4, clearing the road and escorting an engineer element enroute to Katum to prepare the area for extensive operations against the Viet Cong. War Zone C has been the scene of two large operations in the past - Operation Attleboro, a multi-divisional push and Operation Junction City. The area is generally regarded as the one-time headquarters for the Viet Cong and still an important center of guerrilla activity. DAU TIENG - A recent addition to base camp firepower of the 3rd Bde, 25th Inf Div, was marked by the arrival of Charlie Btry, 2nd Bn, 32nd Arty. Charlie Btry's "calling cards" for the Viet Cong are the largest artillery pieces used in Vietnam - 8-inch and 175mm self-propelled guns. With this fire power, the battery is capable of providing support at any point within a radius of their base camp. 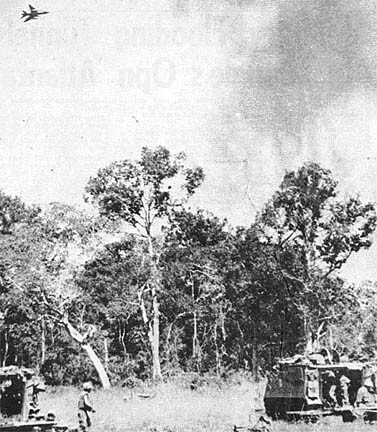 Since their arrival at Dau Tieng on Oct. 13, 1967, Charlie Btry's 175mm and 8-inch guns have been credited with a score of 32 enemy killed, in addition to 275 structures destroyed by the big guns. DAU TIENG - From now on two Viet Cong will know better than to hold their meetings at a trail junction - for another VC there won't be a next time. A recent ambush patrol from D Co, 3rd Bn, 22nd Inf, was moving toward its position for the night when the point man came upon a trio of VC huddled together at a trail junction. "We triggered the hasty ambush and the rest of the patrol opened up on the fleeing enemy," explained 2LT Ronald M. Holloway, patrol leader from St. Louis, Mo. It was dark by this time so the patrol waited in position for further movement. "Moments later we heard whistling nearby and knew that the other VC were attempting to contact a member who hadn't joined them," added Holloway. Cautiously moving in, the men discovered the missing VC's body and his bedroll containing a CHICOM Grenade. Soldiers can now reenlist after only 8 months of active duty and take advantage of cash bonuses, reenlistment schools and assignment options, according to MSG Kenneth Binder, of the 25th Div Reenlistment Office. Under the old criteria one year of active duty was required before soldiers were eligible to reenlist for bonuses and other options. However, those who take advantage of the option were cautioned that they will forfeit future entitlements under the Variable Reenlistment Bonus Program. A five-month test of the new program in Europe resulted in 1500 reenlistments during the trial period. The Army also has recently expanded its station-of-choice reenlistment option to cover enlisted men at all overseas stations. It permits soldiers completing normal overseas tours to reenlist in the Regular Army for a 12-month stabilized tour of duty at their station or area of choice. Soldiers taking advantage of the new 8-month option will be paid the reenlistment bonus immediately. Those serving in short tour areas like Vietnam will be able to take advantage of available school and assignment options upon completion of their normal tour of duty. The Army is also developing a reenlistment option to encourage more noncoms to reenlist for drill sergeant duty in the Army training centers. The Army message points out that soldiers reenlisting for their present duty assignment will be subject to world-wide reassignment at any time "subsequent to reenlistment." SAIGON (MACV) - Members of the U.S. Armed Force s booked for flights on Military Airlift Command or commercial aircraft must place a copy of the pertinent orders directing travel on the top inside of each piece of checked or unchecked luggage. This action has been taken to allow more rapid recovery of mishandled baggage and to reduce claims against the government due to lost baggage. Tags normally affixed to the exterior of luggage, regardless of whether it is checked or unchecked, may become obliterated or detached thus causing delays or confusion in identification and delivery. The orders should be placed inside baggage before the individual reports to a MAC checkin counter for processing. This eliminates the inconvenience of taking this step at the time of check-in. It also reduces congestion at counters and expedites passenger processing. WASHINGTON - Soldiers in grade E-5 or higher now are eligible for assignment to any overseas area with only six months remaining on their current enlistment. Units deploying to Vietnam retain those with at least 90 days remaining service. This is a reduction from the previous requirement of nine month's remaining time for replacements to short tour areas other than Vietnam and 12 months remaining time for shipment to a long tour area. The 9-month and 12-month requirements remain in force for grade E-4 below, under policies modified by a recent DA message. These minimum "time remaining" standards are only part of the story. Career men who receive DA reassignment instructions are expected to reenlist or extend their current hitch enough to cover a normal tour in the overseas area. 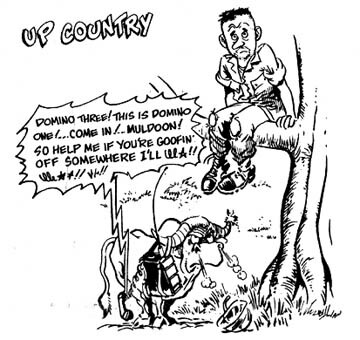 If a man declines to extend his enlistment to cover a full oversea tour, he is reported to the Office of Personnel Operations for "appropriate disposition." As a result, he might still go overseas, or he might have his assignment changed and be barred from immediate reenlistment when his current enlistment ends. The minimum "time remaining" requirement is usually used by the Army to decide whether a man will or will not move overseas from the U.S. or on an inter-theater transfer, regardless of whether he has enough time remaining to complete the normal tour. As an exception to the minimum standards, men who show up at oversea replacement stations with less than the minimum time remaining as a result of their own actions - such as AWOL - will nevertheless go on overseas. Standards applied to all grades for assignment to Vietnam continue to be six month's remaining service on the date of departure for individual replacements and 90 days remaining time at departure for those assigned to deploying units. Relatives and friends of servicemen and women overseas are urged to be sure to include the five digit APO or FPO number on their letters and packages. Mail not containing the APO or FPO number is incorrectly addressed. Last year more than nine million pieces of mail were delayed in delivery, because they were not addressed properly. Of this number, more than three and one half million pieces failed to include the five digit APO or FPO number in the military address. WASHINGTON (ANF) - Applications for the Senior Officer Civil Schooling Program in Communications and Journalism may be submitted to the Office of the Chief of Information no later than Jan. 12, 1968. Infantry Flooding Tunnels In Triangle's Opn "Atlanta"
2ND BDE - American infantrymen are busily drowning a Viet Cong tunnel located on the southern tip of the Iron Triangle that would have cost $251,000 to build in the United States. That figure, based on information from a Viet Cong defector, does not include added expenditures for materials, equipment, and fringe benefits for the workers. At present, members of the 1st Bn, 27th Inf "Wolfhounds," and a platoon from Alpha Co of the 65th Cbt Engr Bn are flooding the tunnel with salt water to either collapse it or coat it with so much corrosives that any VC taking a weapon in there would walk out hours later with nothing more than a piece of rust on a stock. The tunnel complex, discovered during the opening days of the 25th Inf Div's Operation Atlanta, zig-zags for more than 900 meters to reinforced bunkers, open trenches and underground command posts. According to the Chieu Hoi defector who led the 2nd Bde troops to the tunnel, Viet Cong guerrillas enlisted 150 people per day from the local populace and worked them for a year to construct the fortification. Figuring six work days a week, eight hours a day at $1.25 an hour, that would cost $351,000. Add to that the cost of the lumber for shoring, shovels for digging and frequent reconstruction projects after U.S. bombers and artillery blasted the area, you come up with a pretty colossal figure. Despite frequent harassing fires from U.S. forces, the communists managed to keep secret the construction of the tunnel complex by scattering the displaced earth over a large area. The defector added that the communist troops told the peasants they should dig the tunnel for protection from government forces. In order to flood the tunnel, two bulldozers dragged 1,700 feet of five inch hose from the Saigon River to the tunnel entrance. They then hooked up two 5000 pound pumps which churn the salty river water at a rate of 1,100 gallons per minute a distance of 1,000 feet each. According to LTC David R. Hughes of Colorado Springs, Colo., the Tropic Lightning soldiers hope to collapse any walls to secret vaults within the tunnel complex. Yellow dye added to the water will enable aerial observers to spot any entrances the ground troops missed. He said the water pressure by itself would be enough to destroy the passageway, and that the river water, salty from the tides of the South China Sea, would rust beyond recovery any weapon left inside the tunnel for two to three hours. HEROISM - GEN William C. Westmoreland pins Distinguished Service Cross on SSG Ralph Smith, a member of the 25th Inf Div's 2nd Bn, 27th lnf "Wolfhounds," during Operation Atlanta in the Iron Triangle. 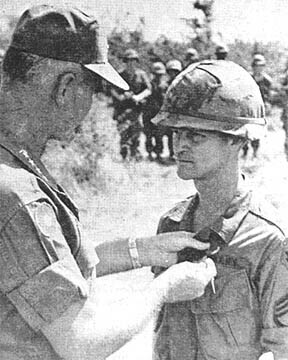 Smith won the nation's second highest award for valor for action during a night assault on May 16, when he destroyed a Viet Cong machine gun position, attacked single-handed an enemy platoon moving across an open field, then led his squad in a charge against another dug-in communist force. 1ST BDE - You don't have to be RA to participate in the "buddy system" enlistment program as is the case with two U.S. Army engineers . . . SP5s Johnny P. Davis and Jimmy C. Davis of the 554th Engr Bn (Const). Both men, who are first cousins, were born and raised in Grand Saline, Tex., attended the same high school together, and have a difference of one number in their social security account numbers. Johnny and Jimmy were both drafted in the Army Dec. 15. Their Army service numbers vary by two digits, and Army I.D. cards by one digit. They completed basic training simultaneously at Ft. Pock, La., and were assigned to the 554th at Ft. Knox, Ky., on March 5, 1966. After a year of training as carpenters at Ft. Knox, they departed with the battalion on the same set of orders, for the Republic of Vietnam March 23, 1967. Both arrived at the 25th Div April 13. Both men, during their tour of service, were promoted from E-1 through E-5 on the same set of orders. On Nov. 30, they both left the Republic of Vietnam on the same plane, on the same orders and will return to the same town in Texas . . . their addresses are one number apart. Asked what they plan to do when they return to the states, both replied, "Same thing, naturally . . . carpentry." 2ND BDE - A soldier is a soldier, and no matter what side he is on, mail is a vital part of his day-to-day existence. Only the method of conveyance differs. A strange but sincere Viet Cong love letter recently reinforced that point to members of the 25th Inf Div's 1st Bn, 27th Inf "Wolfhounds," as they swept through the Iron Triangle during Operation Atlanta. Searching through an abandoned enemy base camp, the 2nd Bde soldiers came upon an inner tube with writing on its inside. An interpreter translated the writing as a love letter from a lonely sweetheart. The infantrymen conjectured the communist soldier used the love letter-inner tube for water wings as he crossed the streams and canals of southern Viet Nam. 1ST BDE - Army Sergeant Ernest Boda from Fairfield, Conn., believes that Viet Cong who live in grass houses should not throw stones. Boda was on perimeter guard with SP4 Leonard Smith from Kansas City, Mo., in the forward base camp of 4th Bn, 9th Inf. Immediately in front of their position was a pond. Shortly before midnight, Boda woke Smith after hearing a splash coming from the pond. "I was just dozing off," says Smith, "when Boda woke me up to tell me about the noise. I told him that it was probably just a fish." Minutes later someone began throwing stones. Both men decided that it wasn't a fish, but rather Viet Cong probing their line. Both men held their fire. The stalemate was broken when the stone thrower tossed a hand grenade into the water, exploding a yard in front of the two 25th Div soldiers. "We immediately opened fire," explained Boda, "and then waited out the rest of the night." At daybreak a search of the area revealed a blood trial leading off into a woodline. DAU TIENG - A week-long siege of a Viet Cong regimental-sized base camp found by 3rd Bde, 25th Div, troops southeast of Dau Tieng has resulted in the destruction of the enemy bastion. Twenty-eight Viet Cong were killed by the combination of heavy airstrikes, artillery and the mechanized forces of the 2nd Bn (Mech), 22nd Inf. Over 400 bunkers, 250 two-man spider holes, and 1500 meters of trench were destroyed in the spiderweb-like base camp. According to 3rd Bde Commander COL Kenneth E. Buell, the base camp was a key to an expected attack on the Vietnamese District Headquarters located in Dau Tieng by the 101st Viet Cong Regiment. Papers found among eight of the enemy who were killed in an ambush indicated that the 101st was massing in the areas. In eight days over 30 airstrikes and thousands of rounds of artillery smashed into the 900x800 meter entrenchments. Many bunkers were 10x10x6 feet in size and had three feet of overhead cover protecting the Viet Cong who were found in the base camp. The first day the camp was discovered, Bravo and Charlie Companies of the "Triple Deuces" uncovered 100 bunkers before intense enemy small arms and RPG rocket fire forced their withdrawal. The Air Force then pounded the area until it was a veritable dust heap. Returning to the camp, a grenade factory, complete with crude furnace, hand and rifle grenade molds, VC Claymore molds, scrap metal, and 300 wooden sandcasting frames were found and destroyed. Twelve hundred pounds of rice, a small number of grenades and ammunition, a typewriter, and clothes and documents were captured. Twenty dead enemy troops were found within the camp, either in shallow graves or in the blasted underbrush. Another eight Viet Cong, part of a mortar squad that had mortared the battalion command post, were killed by an ambush patrol from Charlie Co of the "Triple Deuces." AN F-100 FIGHTER-BOMBER STREAKS OVER THE ENEMY ENTRENCHMENTS. AFTER A WEEK-LONG SIEGE OF A VIET CONG REGIMENTAL-SIZED BASE CAMP, MEN OF THE "TRIPLE DEUCES" MOVE THROUGH THICK BRUSH IN A SWEEP OF THE AREA. GRENADE MOLDS FOUND IN THE BASE CAMP. LTC A.G. NORRIS, 2ND BN CO, CARRIES VC LADLE. A LIEUTENANT AND HIS RTO PREPARE TO ENTER CAMP. 1ST BDE - The damp Vietnamese night closed in around the men and jeeps from the 25th Military Police Co as they approached the Tay Ninh base camp gate. After briefly coordinating with the guards, they and their blacked-out vehicles rushed out into the night. They made a sharp left, snapped on the headlights and hurtled down the unlit road, on their way to conduct their first night patrol in Tay Ninh - a city of 65,000 that lies only 16 kms from the Cambodian border. The jeeps sped past a graveyard favored by Viet Gong snipers, and covered the 3 kms to the city in what seemed to be the space of a couple of heartbeats. Here, they linked up with a team of Vietnamese National Police with whom they would be working that night. "We're teaming with the Vietnamese to put 24-hour pressure on the Viet Cong in this area," explained SSG Cecil M. Coffey, leader of the 1st platoon's squad that made up the patrol. The MPs and National Police had been setting up check points during the day in the Tay Ninh area. "Now we're going to tighten the noose by working at night too," said Coffey, who is from Front Royal, Va. Soon the MPs in their "Rat Patrol" jeeps - mounted with an M-60 machine gun - began the night's first tour with a squad of National Police. The vehicles moved out of the center of the city onto the back streets. Weaving down roads one-vehicle wide, they passed lantern-lit huts from which curious Vietnamese stared. Occasionally the patrol stopped to set up check points. The National Police screened the papers and searched the vehicles of those who were swept into the net, while the children stopped catching crickets under the street lights to look on. At one point, a group of ARVN troops rode through, moving to intercept an unknown-size Viet Cong force reportedly in the area. Several minutes later, flares lit the sky in the direction that the soldiers had gone and distant gunfire could be heard over the hum of insects. The patrol moved into ambush positions but there was no sign of the enemy. Mounting their jeeps, the men resumed their slow circuit through the city. At dawn, the patrol raced back to base camp. The first 25th Div participation in the Tay Ninh night patrol had ended. "By itself, this night may not seem like much," said Coffey, "but when you step back and look at it again, night patrolling in the city becomes a major step in cutting down Charlie's mobility during his favorite hours. And like police in a squad car, we create an atmosphere of security by just being there." Tiny, 11-month old Kieu Thi Kim Phuong (Kim) is a lucky little girl. The victim of a serious burn recently, Kim is well on the way towards recovery, thanks to the efforts of a 554th Engr Bn (Const) surgeon. 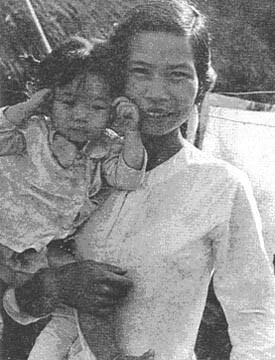 CPT Richard M. Klaus "Doc" or "Bac-Si" as the villagers of the small hamlet of Bac Ha 1 call him - was on the scene shortly after little Kim was severely burned on the left leg by scalding hot water. The 29-year-old, former Philadelphia surgical resident was "making his rounds" in the village when Kieu Cao Dinh, father of the injured girl, brought him news of the accident. Doc Klaus treated the wound, which is now healing nicely, and says little Kim will be A-OK in another week or two. SAIGON (MACV) - The Cordon magazine published by the Order of DeMolay, is seeking pictures, short stories and letters about achievements of DeMolays in Vietnam. Information personnel and individual DeMolays who can provide information for publication may forward it to Jerry Palmer, Assistant Editor, The Cordon, 201 East Armour Blvd., Kansas City, Missouri-64111. "I've gained a lot of satisfaction knowing I've helped these people, it has all been a very good experience," stated SP4 Walter Washington of East St. Louis, Ill., as he prepared to go out on his 300th Medical Civic Action Program (MEDCAP). Fifty MEDCAPS are a lot for one medic to make during his tour here but Washington has now made 300 for the 25th Inf Div's Spt Cmd. Washington is with the 25th Med Det and has been going on MEDCAPS since the Spt Cmd's S-5 section began their program. "Besides treating infections and sores, I've done dental work and have even taken out bullets," he added, "most of the people who come to the MEDCAPS suffer from TB or some lung infection." According to 1LT Marlowe Haakenson from Osol, Minn., team leader for the command's MEDCAPS team, "We have treated more patients than any team in the division. We are proud of the work we do and I am proud of the men on the team. Washington has been on the team since its beginnings and has shown great leadership and I can really depend on him to get the job done." "I can see the work we do is successful because when we return to some of the villages I see familiar faces and they are cured or need treatment for some new ailment," stated Washington. After each patient is examined and treated they are given soap. Another part of the MEDCAP takes place outside as 1LT John Ritchie, of Philadelphia, and PFC Carlos Valdez from Brownsville, Tex., play football or Whiffal ball with the kids that always crowd around. DAU TIENG - The best way to beat Charlie is to be faster than he is. A good example, is the reaction of the 3rd Bn, 22nd Inf, 3rd Bde, 25th Inf Div, to a recent Viet Cong mortar attack in the Iron Triangle, 32 kms northwest of Saigon. As the first three rounds left the enemy tubes, the cry of "mortars!" threw the 81mm mortar crews of Bravo and Charlie companies into action. Before the first of the enemy's three shells hit the ground, the 3rd Bn, 22nd Inf, had as many rounds in the air aimed at the attacking VC. The battalion continued to pour out the rounds. Charlie decided his three rounds were all he had time for and fled into the jungle. HEAVY - Two 2nd Bn "Wolfhound" soldiers pass a 100 lb bag of rice up the line into a waiting helicopter for eventual distribution to needy civilians. The infantrymen found more than 15,000 lbs of rice in a cache deep in the HoBo Woods. 1ST BDE - A remarkable story of U.S.-Vietnamese cooperation is being written in a village lying less than a thousand meters from the former Viet Cong infested Hobo Woods. Surrounded by guerrilla controlled hamlets, the village of Trung Lap and its ARVN Ranger Training Center was an island in a hostile sea. It was to this "island" the MACV advisor, CPT Robert Caldwell, came in late 1966. Called an "inspiration leader" by those who worked with him, Caldwell was responsible for the building of a dispensary (now staffed by two MACV medics); creation of a center for refugees; establishment of a village health program; and the building of a shrine for the village elders. By the time he was ready to return to his home in Vivian, La., Caldwell had laid a firm foundation of US support for Vietnamese self help. Those who came after him have built on this base. 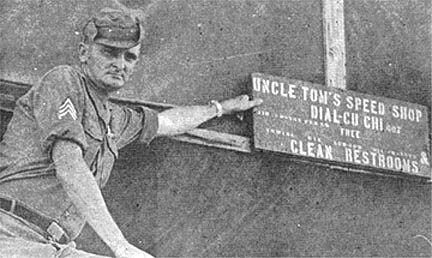 The 25th Div assigned responsibility for Trung Lap Civic Action Programs to the 4th Bn (Mech), 23rd Inf, in July of 1967. Since that time, CPT Gery Strohm of Phoenix, Ariz., and his section, have supported the following projects: Housing for 40 families of ARVN cadre at the training center; a 55-gallon "burning barrel" for disposal of wastes from the dispensary; 6 concrete-lined wells; 22 latrine basins for the training center and village; refurnishing of the schoolhouse and dispensary; a 10-foot-high protective berm around the refugee center, joining it to the rest of the village; and the leveling, of the area around the dispensary to prevent pools of water from collecting. The Tomahawks also hold several Medical Civic Action Programs (MEDCAPS) at the village each week, during which the battalion surgeon treats a total of 250 patients. "Except for one or two of these projects," Strohm explained, "all we provided was the materials, the people did the work." The battalion's maintenance section worked on their own time to construct swings and seesaws for Trung Lap's playground and the support platoon has put in extra hours handling S-5 Chinook supplies. The 65th Cbt Engr Bn helped build the berm and level the area around the dispensary. "But the workers you see out there day-to-day, are the villagers themselves," Strohm said. "It's been a pleasure to work with these people because they are vitally interested in helping themselves and insistent on doing it with their own hands. All they ask for is hard-to-get materials and some equipment." LT Le Kim Houng from the training center is one of the local leaders for whom Strohm has high praise. "Lieutenant Houng is of a breed of ARVN officers who are making a significant contribution to the improvement of his country," Strohm commented. "Dynamic and selfless, he sees what his people need and takes steps to get it." One of the ARVN lieutenant's most successful innovations was placing a 23-inch television set, obtained from the South Vietnamese government, in the village marketplace. Perched in a raised concrete shelter, its effect on the 10,000 villagers has been almost hypnotic. "About a thousand people watch the set each night," Strohm said. One night they had a mortar attack. The people just lay down in the marketplace and continued watching. The only casualty was a man who had stayed at home." The government is providing a second set. Like ripples in a pond, Trung Lap's successful self-help story has reached people living nearby. One 14-year-old boy walked to the MACV dispensary from a Viet Cong-controlled hamlet in the vicinity. Found to have an enlarged heart, he was brought to the 125th Sig Bn's S-5 section which succeeded in scheduling open heart surgery for him in Switzerland. Another boy has been provided with a glass eye, again through coordination between the infantry and signal battalions. The battle for Trung Lap is not over, despite the recent progress. 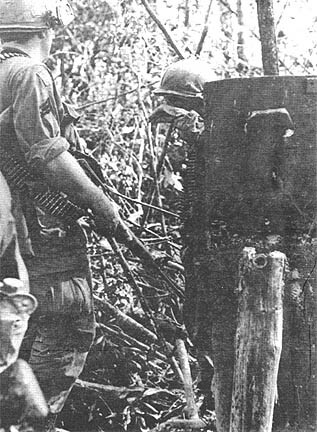 Viet Cong terrorists struck during the national elections, leaving a claymore mine near a restaurant in the village. The mine's blast killed one and wounded seven Vietnamese. "It isn't going to be easy for them, living where they do," Strohm commented. "But now most of the people have a personal stake in Trung Lap's future and 'their leaders are men who just won't quit. I think in the long run Trung Lap has the edge. Just look how far they've come already." 1ST BDE - Putting the horse - or the oxen - before the cart doesn't always lead to a successful trip, four troopers from the 4th Bn, 9th Inf, learned recently. Alpha Co's 3rd Platoon had been assigned to patrol Highway 4 near Tay Ninh. The soldiers detained an elderly Vietnamese driving an oxcart filled with hay because he lacked valid identification. The old man was sent to Tay Ninh for questioning - leaving his cart and oxen. With dusk coming on the men were ordered back to the 25th Div base camp; and, "oh yes, bring the Vietnamese property along with you," came the word. SP4 Robert Almack of Miami, Fla., and three of his buddies were detailed to drive the oxcart. They hitched the oxen up and pointed them in the direction of the base camp. The beasts had their own idea of where home was however, and began ambling off at a 45-degree angle to the direction the men wanted to go. "There we were," said Almack, "three and a half Ks from camp with a pair of dumb animals determined to take us home - their home. We coaxed them and cursed them, but an hour later we were still stuck in the same place." The stalemate finally was broken when the battalion's recon team rode up to investigate. They radioed the news of the foursome's predicament back to the company and received permission to bring the troops in. The oxen? They were left safely tied to a tree, dining on the hay that they had been hauling and were picked up the next morning by their owner who was carrying a newly-issued I.D. card. AHHH YES - This lovely young thing is Ann-Margret. You know, the one our gate is named after? Any resemblance is purely accidental. DAU TIENG - Eight Viet Cong who were laughing and giggling to themselves as they ran from their mortar positions were killed by a 3rd Bde, 25th. Div, ambush patrol 8 kms southwest of Dau Tieng recently. The. enemy mortar squad had lobbed 29 rounds into a night position of the 2nd Bn (Mech), 22nd Inf, and were fleeing their position when they ran into the ambush led by SP4 Arnold Farlow of Sophia, N.C., 100 meters away. "I could see the flash from the tubes as the mortar rounds were fired," related PFC Austin Kreeger of York, Pa., a member of the patrol which was set along one of the trails leading through the dense jungle. Before the first round of the 29 had hit the ground, the VC broke down the mortar and started out of the area. Sp4 Eugene Buhr of Sumner, Iowa, said, "I rolled over to my machine gun and took it off safety." Led by a VC with a flashlight, the enemy rounded some bushes and ran down the trail towards the ambush. "They were grouped up and were talking and giggling to themselves," remarked Buhr. "When they ran into the kill zone, I opened up. Buhr downed five with the first burst of his M-60 machine gun. There were no friendly casualties. One AK-47 assault rifle and the mortar bipod were captured. ABOVE IS THE NEW MILITARY PAY SCALE AND RATES NOW IN EFFECT. THE INCREASE IS RETROACTIVE TO OCT. 1, 1967. DAU TIENG - Thirty-six tons of unpolished rice were recently discovered by the 3rd Bn, 22nd Inf, 3rd Bde, 25th Inf Div, during Operation Diamondhead near the village of Ben Chua, 8 kms south of Dau Tieng. The three-day search of the area revealed numerous caches in the jungle, some of them with the rice already packed in 100 pound bags. Much of the rice found in the area, which is believed to be the district resupply headquarters for the Viet Cong, had to be bagged by the 3rd Bn "Regulars" for evacuation to Dau Tieng. From there the 36 tons of grain was distributed to the Vietnamese people in the Dau Tieng area.